Nicholas Ruth was born and grew up in Philadelphia, PA. He received a B.A from Pomona College and a M.F.A from Southern Methodist University. His work comments on how humans have reverted to using technology as a way of reaching out yet using it as a form of protection from everyone else. Ruth has received several awards and has been exhibited throughout the US. 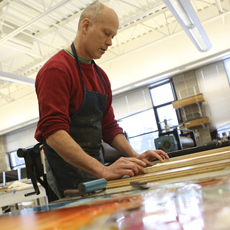 He is an associate professor of art and architecture at Hobart and William Smith Colleges. He resides in Rochester, NY.